Apple's voice assistant Siri has been knocking about in Apple products since the launch of the iPhone 4S way back in October 2011. 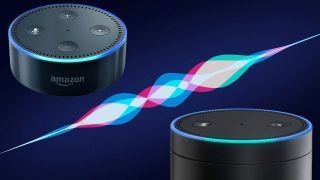 So, with the current wave of home voice assistants storming the tech world, you'd think Apple would be keen on having an answer to Amazon's Echo and the Google Home. Speaking to the Backchannel blog to mark the 10th anniversary of the original iPhone's launch, Apple SVP Phil Schiller suggests that the company has little time for voice-only products and interfaces. "Having my iPhone with me as the thing I speak to is better than something stuck in my kitchen or on a wall somewhere,” he said. For Schiller (and Apple, when you count the man as the company's mouthpiece as senior vice president of worldwide marketing), the importance of display technology remains key to a comfortable user interaction. “People are forgetting the value and importance of the display,” said Schiller. Not that Schiller feels that Siri cannot hold its own in this voice-focussed arena. "I’m so glad the team years ago set out to create Siri — I think we do more with that conversational interface than anyone else," he stated. But with a recent CES that was dominated by voice-controlled products - predominately those featuring Amazon's Alexa assistant - Schiller's stance is beginning to look merely defensive, a protective measure for the ten year legacy of the screen-focused iPhone experience.